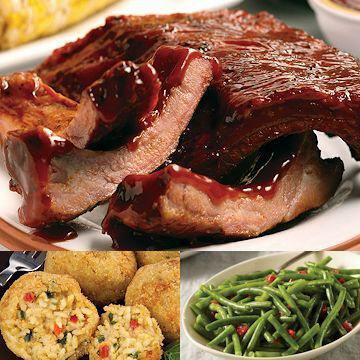 Round up your family and bring your appetite! Our tender, meaty baby back pork ribs are fully cooked and smothered in a slightly sweet and tangy BBQ sauce for a down home flavor! We also include lightly breaded and prebrowned Risotto Cakes that are a creamy blend of arborio rice, pepper jack and parmesan cheese along with a mixture of roasted red peppers, poblano chiles and shallots for a zesty flavor with a little kick. Plus Asparagus Spears With Hollandaise Sauce complete this spread. Meal serves 4. Do Not Thaw!�Oven: Preheat oven to 325 �F. Run sealed package under cold water for 10 seconds to release film. Remove pork ribs and sauce from package and wrap in foil. Place in pan on center rack of oven and heat for 60-70 minutes (30-40 minutes if thawed).�Oven - Tender Restaurant Style: If you like meat that falls off the bone, try this method: Preheat oven to 350 �F. Remove pork ribs from package and place on a large sheet of heavy duty aluminum foil. Add 3 tablespoons of water to the foil and wrap tightly, crimping the seals of the foil. Place on a baking sheet and bake for 70-80 minutes.�Microwave: Remove ribs from package as directed above and place meat side up in microwave safe dish. Cover with plastic wrap, venting one corner. Heat on high for 5-6 minutes flipping halfway through cooking time.�Grill: Preheat grill to high. Run sealed package under cold water for 10 seconds to release film. Remove pork ribs from package, wrap in foil crimping edges. Heat on grill for 23-25 minutes flipping halfway through (10-12 minutes if thawed). Do Not Thaw!�OVEN: Preheat oven to 350�F. Place desired number of Risotto Cakes on a foil lined baking sheet, allowing approximately 2 inches between pieces. Bake for 30-35 minutes.�MICROWAVE: Place 1-2 Risotto Cakes in a microwave safe dish. Cook on high power for 2-3 minutes.�PAN-FRY: Preheat 2 teaspoons of cooking oil for each Risotto Cake in a large non-stick skillet on medium heat. Form the Risotto Cake into the shape of a patty. Add to skillet, cooking for 2� - 3 minutes on each side. Ingredients: Pork Ribs, Salt, Pepper, Barbeque Sauce (Ketchup (Tomato Concentrate made from Red Ripe Tomatoes, Distilled Vinegar, High Fructose Corn Syrup, Corn Syrup, Salt, Onion Powder, Spice, Natural Flavoring), Vinegar, High Fructose Corn Syrup, Water, Salt, Garlic and Onion Powder, Cayenne Pepper, Spices, Caramel Color). Ingredients: Cooked Rice, Water, Bleached Wheat Flour, Soybean Oil, Pepper Jack Cheese (Milk, Cheese Cultures, Salt, Enzymes, Annatto Color, Calcium Chloride, Jalapeno Peppers, Vinegar, Sodium Benzoate - preservative), Red Bell Peppers, Poblano Chiles, Onions. Contains less than 2% of the following: Beta Carotene Color, Carrot Powder, Chicken Fat, Chipotle Chiles, Citric Acid, Corn Flour, Corn Starch, Disodium Guanylate, Disodium Inosinate, Dried Whey, Garlic, Gelatinized Wheat Starch, Guar Gum, Hydrogenated Cottonseed Oil, Hydrogenated Soy & Corn Protein, Methylcellulose, Modified Corn Starch, Mono & Diglycerides, Natural & Artificial Flavors, Olive Oil, Parmesan Cheese (Milk, Cheese Cultures, Salt, Enzymes), Salt, Shallots, Sodium Alginate, Sodium Benzoate- preservative, Sodium Tripolyphosphate, Soy Lecithin, Sugar, Yeast, Yeast Extract. Contains: Wheat, Milk and Soy. Produced in a facility that also processes egg ingredients.